As winter continues to leave a seemingly indelible mark on my psyche, I have to force myself to forge on with the anticipation of better things to come. With close to six feet of snow on the ground in the last week and more in the forecast, spring appears a very long way off indeed. However, I have decided to stop complaining about this infamously historic winter here in New England, despite the fact that there is good reason to continue doing so. There is much to decry- the school closings, the horrendous traffic, work interruptions as well as that cabin fever thing. The world is a vast place and a myriad of people inhabit environs as intemperate as this. Surely the Inuits of North America and the people of Siberia would be a little amused at all the whining going on around here about the weather. I wondered how to embrace this wintry madness. So as I begin to dig out from the second blizzard of 2015 (are you listening Al Gore? 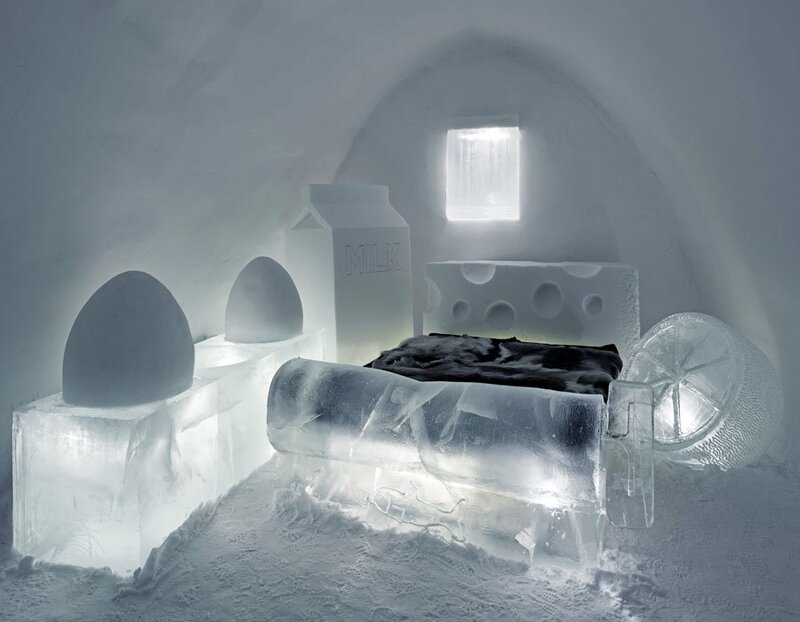 ), I remembered watching a program about an ice hotel and thinking to myself, "who in their right mind would actually pay money to stay at such a place?" Sure, the drinks at the bar would stay cold. My Martini would never have to worry about a slow warm death. Not that it does now mind you. But, that would seem to be the only advantage. Imagine sleeping on a block of ice? I don't care how many reindeer skin blankets they put on the damn thing. The places are kept cold, about -5 C. From what I can find, there are about a dozen of these extraordinarily elaborate igloos about the world from Canada to Sweden and beyond. Even Japan has entered the fray. At a much more reasonable scale, the ice bar has made an appearance. Nearly every major city has one of these novelty filling stations, serving mostly as a tourist attraction, but a fun night out nonetheless. The bar, sofas, chairs, and tables are all carved from ice as are typically the glasses. After paying admission, one dons gloves and a parka. 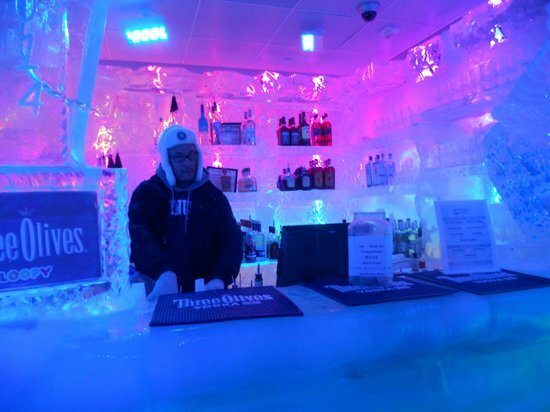 Some ice bars, such as the Frost Ice Bar in Boston, offer boot rentals to keep the feet warm. And, for those truly unprepared, there are hats for purchase in the gift shop. The Frost Bar makes a nice gin potable-The Lion and The Unicorn. Concocted with Farmer's Organic Gin, Pavan, Lillet, and Blue Curacao, it is named after the statues at the State House in Boston which serve as symbols of the British Crown which were torn down and burned during the American Revolution and then later rebuilt. Fortunately, our differences have been resolved. More reasonable still is TC's Triple G, aka Glacial Gin Garden. Admission is free and the gin is grand- top notch stuff, while the ice is courtesy of nature. Although, I realized that the ice is totally superfluous at these frigid temperatures obviating the need for a shaker. Still, it helps to complete the picture. Unfortunately, -5 Fahrenheit is nothing like -5 Celsius. Mittens may stick to the shaker. I was concerned the steel olive skewers would do the same and so decided on a lemon peel garnish. "When life gives you lemons, make lemonade," or better yet use the lemon and make a Martini!